You’ve grabbed some grub on your way out the door so you don’t starve between classes. All good. Just make sure your study snacks don’t drive other students crazy. Slurp, slurp. Crackle, crackle. Crunch, crunch. These are some of the annoying sounds your fellow students make as they feast on all kinds of messy, noisy food in the library and during class. All that chomping and guzzling can drive you crazy, not to mention the smells that float through the air from fried onions and tuna salad. That crazy-mad guy has a point. If you’re too starved to wait for lunch or dinner, it’s worth considering (and sourcing) some “polite” snacks that won’t bring on the haters, and are delicious and healthy to boot. Here are some guidelines for doing that. Bonus points: Bananas are rich in potassium, which helps your muscles recover from a workout. They also contain vitamin B9 (a.k.a. folate), a nutrient that may ward off depression. Besides mood-boosting B9, bananas also have tryptophan, a precursor for the synthesis of serotonin, the brain chemical that can help relieve anxiety. Bonus points: Add blueberries to your smoothie. They’ve got tons of health benefits, which include improving concentration and memory. Not that: Chips and crackers — which are both noisy and non-nutritious. Bonus points: Cheese is a smart snack, as well as a comfort food. It’s rich in calcium and phosphorous, which support healthy bones and teeth. If you’re looking for real sticking power, pair some cheese with a piece of quiet fruit like a soft pear for fiber, says nutritionist Jennifer Markowitz. Grapes are a good option too. Not that: Microwave popcorn, raw onions, or fish. To you it’s delicious. To everyone else it’s like a punch in the face. According to some, these are among the top smell offenders for offices, so best to nix the habit now. Bonus points: Turkey is a great source of lean protein. Proteins are the body’s building blocks, used to make bones, muscles, skin, and blood. Incorporating lean protein into your diet is an important part of a healthy eating plan. Whole grains are high in fiber, which keeps the pipes from clogging up. Not that: A hot dog with sauerkraut or other fixings. Many people find the smell of hot dogs nauseating, and sauerkraut doesn’t rate much better. Also, keep in mind that the processed meat in wieners is associated with an increased risk of colon cancer. Plus, they’re loaded with belly-bloating sodium. Bonus points: Peanut butter is a great source of plant-based protein, and the whole grains add filling, healthy fiber. If you’re allergic to peanut butter, try almond or sunflower seed butter, two delicious alternatives. Not that: Fast food. For some of us, the scent of Mickey D’s fries creates unwanted mouth watering; for others, it’s just wretched. In any case, you can smell fast food a mile away, so be thoughtful of your study mates. If you need another reason to lay off the fries, consider this: One of the 19 (nineteen!) ingredients in McDonald’s fries is dimethylpolysiloxane, an anti-foaming agent! Plus, Markowitz says that fried food puts a dent in your brain power. Your body will send blood and tons of energy to your gut to digest such a greasy meal, which means you’re more likely to feel fatigued and lack focus. Bonus points: Many nutritionists call sweet potatoes one of the planet’s healthiest foods. They’re rich in lots of antioxidants, minerals, and vitamins, especially vitamin A, which plays an important role in maintaining healthy vision and neurological and immune system function. Not that: Hard-boiled eggs. Though eggs are actually one of the great superfoods, you won’t win any friends if you crack open a hard-boiled egg in the middle of class or a study session. The smell of sulfur can be overpowering. Bonus points: With 250 milligrams of bone-building calcium, you can’t go wrong with yogurt. 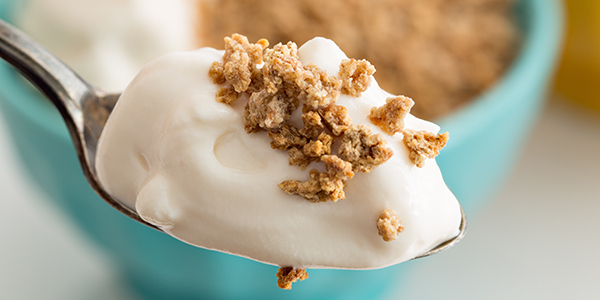 For the best protein boost, Greek-style yogurts like Chobani and Fage offer 50% more protein than other types, even after you adjust for the different serving sizes. They’re also thicker and creamier. Sprinkle some granola, raisins, or mixed nuts on plain yogurt. Fruit flavored yogurt is fine, but it has more sugar. Now that you’ve cleaned up your snack act, go a step further and clean up after yourself. Clear away crumbs, and toss any leftovers in a closed container or plastic bag. Wipe down your desk with a paper towel or portable wipes. Be considerate of the next person to fill your chair. If you’re absolutely craving some curry in a hurry or a scoop of tuna salad with crackers, plan on enjoying your meal in an open cafeteria, in a restaurant, or outdoors, beyond earshot and the sensitive sniffers of those who are seeking peace and quiet and trying to concentrate on their studies.